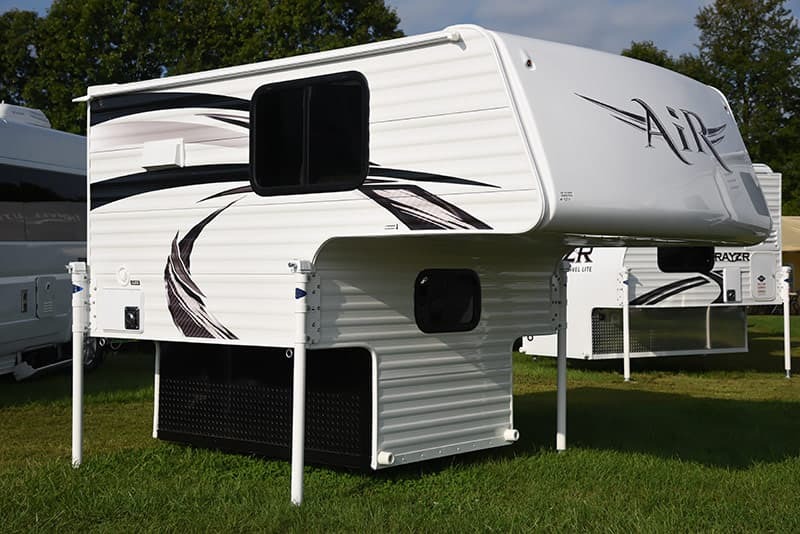 Travel Lite changes its entire Super Lite line to flat-metal .040-inch aluminum siding, launches the Black Out package, updates their exterior graphics, and brings features over from their popular Falcon trailer line. We truck campers are a proud bunch. We don’t like our rigs being associated with anything that doesn’t demount from a pickup truck. Walk up to a truck camper owner and say, “Your truck camper is the son of a travel trailer” and you might get punched in the nose. Did you say, “Travel trailer?” Them’s fightin’ words! We can certainly relate to this vigorous dedication. When we go to an RV show we might glance at other products, but we don’t take them too seriously. For years my motto has been, “If it doesn’t demount, it doesn’t count”. And folks think Class A motorhome owners can be snooty. Taking a step back, I’ve often wondered if our passion for truck campers has blinded us to advancements in trailers and motorhomes that could move truck campers forward. Are we so proud of truck campers that we’re missing potentially important material, design, and feature advances being made in other areas of the RV marketplace? Hard as it is to admit it, I believe the answer is, “Yes!” How do I know this? From observing the truck camper manufacturers who also build travel trailers and fifth wheels. These multi-line RV manufacturers are constantly bringing elements from their towable products over to truck campers, and vice versa. With a wider view of the marketplace, these companies can sometimes spot trends in material, design, and features before the camper-only manufacturers. Being a truck camper manufacturer also gives them a huge leg-up on companies that only build towable products. Put another way, being multi-line can be a major source of competitive strength. All of this came to mind when we talked to Jay Handy, Regional Sales Manager for Travel Lite. 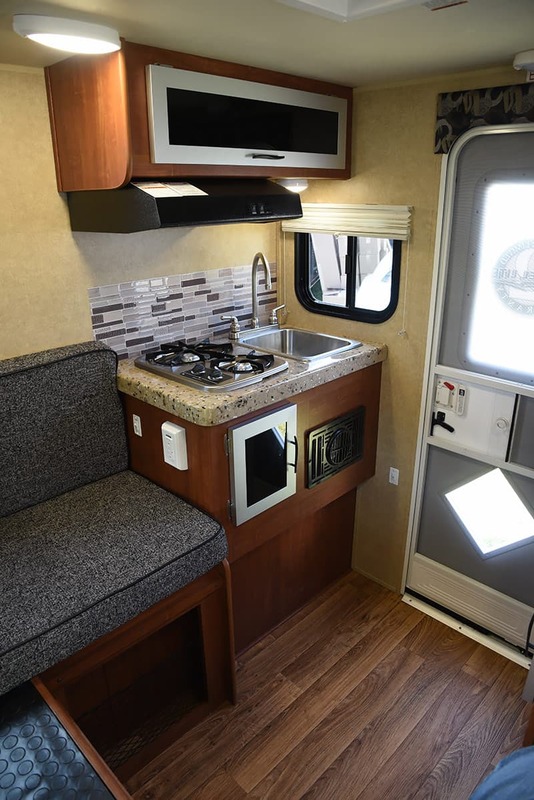 During our conversation about the 2018 Travel Lite truck camper updates, he explained again and again how their successful Falcon travel trailer line had brought fresh ideas to their truck campers. At first blush these sounded like fightin’ words. But, before we punched Jay in the nose, we had a second thought. There would be no Falcon without Travel Lite’s long history in truck campers. And if building the Falcon helped them push their truck camper line forward, maybe we are okay with this. Just don’t make it a habit Travel Lite. Truck campers rule. To get more information about the 2018 Travel Lite updates, we talk to Jay Handy, Regional Sales Manager at Travel Lite RV. TCM: Before we talk about your 2018 announcements, introduce yourself to our readership and your history in the RV business. Jay: I’ve been in the RV industry over twenty years on the manufacturer and the retail side. I have loved every minute of this fun business. I have been at Travel Lite for five years and really like the family atmosphere here. I am Travel Lite’s Regional Sales Manager for the East Coast of the United States and Canada. TCM: Last year Travel Lite launched the Falcon travel trailer and it became a hit. Did the success of the Falcon take your focus away from truck campers? Jay: Not at all. Truck campers have always been the bulk of our business. We have done many great truck camper upgrades for 2018 including new flat metal exteriors and more modern features. I also want to point out that we sold more truck campers last year than at any point in Travel Lite’s history. In 2017 we’re on pace to triple that number. TCM: Travel Lite launched the Travel Lite Air truck camper last fall. The pricing and distribution concept of the Air was unique in the marketplace. How has the Air done since its launch? Jay: The Air is doing well. Dealers and customers like it because it’s no frills, so they don’t need to worry about options. It is the lightest weight hard side camper on the market.